Possum skin cloak made for Festival of Pacific Arts, Lee Darroch and others, featuring design by Maree Clarke, 2008. Photo Elena Green, courtesy Craft Australia. 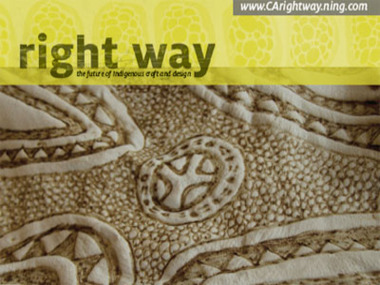 right way is Craft Australia's 2009 national online forum, an online discussion and community about future directions for Indigenous craft and design. You are welcome to have a look at what is being talked about, and view the PHOTOS, VIDEOS and skype conversations. Over the three month forum there will be highlights on particular projects. The events calendar will let you know about these webcasts, skype conversations, blogs and videos as they are posted. We ask you to keep your contributions to right way on topic: the future of Indigenous craft and design. Craft Australia is the top advocacy organisation for Australia's contemporary craft and design. Its vision is as an essential contributor to Australia's national and international cultural and creative industries. Craft Australia lobbies for those industries and brings them international attention.